This is one of the great comfort foods. We have it at anytime of the year irrespective of the season. I first cooked kedgeree about 30 years ago. Since then I have played around with the recipe until I created the one that was not only easy to cook, but was the one I liked most. Kedgeree has now been established as a tradition for Boxing Day brunch. My children insist. It is also great party fare. I always cook it when I’m entertaining and have spare copies of the recipe to give to guests who request it. The first time I ate kedgeree was in 1980 when His Nibs and I were doing the ‘grand European tour’ for the first time. We stayed at a disgracefully expensive converted old manor house in St Albans complete with its own lake, ponds, amazing gardens along with an assortment of ducks, peacocks and swans that loudly proclaimed their ownership of the grounds. As part of the breakfast menu was kedgeree, a dish I had never even heard of before much less tasted. One mouthful began a lifelong romance with this eccentric dish. I came home and began to try to reproduce the dish from memory, experimenting with different ingredients and alternative cooking methods until I was satisfied with the end result. There were no recipes for kedgeree in any of the Australian cook books of the time. To describe kedgeree is difficult. It needs to be tasted but here goes nothing. 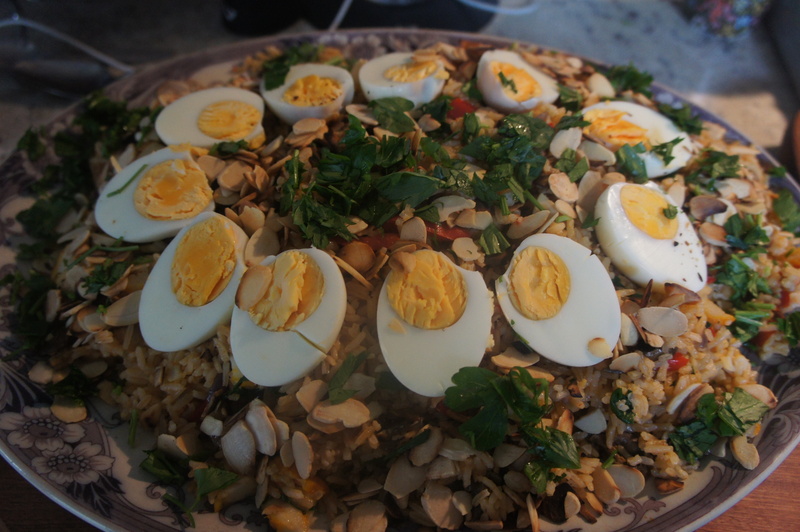 Kedgeree is curried rice with vegetable and smoked fish, finished with chopped coriander, boiled eggs and toasted nuts. It sounds disgusting but is a taste sensation. Kedgeree was created in India during the time of the Raj for the Scottish regiments posted there who were missing their salted fish dishes for breakfast. Although its origins are in India it is considered a Scottish dish, but it is really a heady mixture of two totally opposing food cultures coming together in one scrumptious multicultural match made in heaven. Kedgeree is usually cooked on top of the stove, as you are supposed to do with risotto, but I don’t. I cook this dish in the oven. Truth be told I also cook risotto in the oven much to the horror of purists and food fascists, but that is another story. Place the smoked cod in a dish and cover with milk. Allow the fish to sit in the milk for a couple of hours to allow the salt and colouring to leach from the fish. Dice the onion and mince the garlic. Chop the capsicums into bite size pieces. Melt 50 grams of butter, throw in the onions, garlic and capsicum and saute until they begin to soften. Stir on the curry paste and cumin and stir it all around. Add the remaining butter and stir in the rice until the rice is nicely coated with butter and spice. Add stock and seasoning. Bring it all to the boil and bubble away for a couple of minutes. Put the dish into a preheated oven, 170C for fan-forced, 180C for conventional ovens. It will be about 20 minutes for Basmati Rice, 30 minutes for brown rice. While the rice is cooking in the oven take the cod out of the milk and pat dry and then shove it into the microwave for a minute or so. Flake the hot fish into bite sized bits making sure you get any bones. Cook the peas in the microwave for a minute or so. 5 to 10 minutes from the end of the rice’s cooking time add both fish and peas to the rice in the oven and stir it through. Spoon out onto a warmed platter. Arrange the egg halves on top of the dish with a sprinkling of almond flakes on top, followed by chopped parsley. We have one member of the family who hates coriander so I put coriander in its own little dish for those who want it. For those who like creamy curries there is also the option of adding cream (or yoghurt) to the dish, something I tend not to do. But 2 dessert spoons of thickened cream or 2 dessert spoons of yoghurt will add a creaminess to the dish without being too cloying. Posted in Food, Politics, Sport, Kitchen, Recipes and tagged curried rice dishes, Kedgeree, smoked fish and curried rice. Bookmark the permalink. I make this in baking dishes which must be lined with alfoil otherwise the chocolate will stick and make a mess. The alfoil can simply be lifted from the tray when the Rocky Road has set and peeled off. I scatter the tray with good quality dry roasted cashew nuts, real glacé cherries and pink and white marshmallows. Can halve cherries if large. I use two to two and a half large blocks of Black and Gold cooking chocolate for each tray, both light and dark combined. Bash the chocolate while still wrapped to break it into small pieces. Melt over low heat with half a block of Copha. Start melting the copha first or the chocolate will burn and stick to saucepan. Keep turning over gently as it melts. Let it cool a little before pouring over the other ingredients. If too hot the marshmallows disintegrate. Set in frig or cool place. Does not take long to set. Cut into bite size pieces and enjoy. I have been making this for about 30 years so can’t really be specific about amounts but I am always generous. The amount of chocolate and copha melted for a baking dish will depend on the size of the dish. If it is large, I use more chocolate. I often use good quality cooking chocolate like Nestlé’s or Plaistow’s combined with the cheaper brands. But the cheap brands used exclusively still taste yummy. Ofcourse you could use all dark or all light chocolate depending on taste. This has been my Christmas gift to school teachers and neighbours for years. Gift wrapped on a Christmas paper plate & surrounded in cellophane printed with holly sprigs plus tied with red and green curling ribbon. Very pretty and my friends would be ringing me if they didn’t get it. Despite the fact that my children left school years ago, there are still favourite teachers who get my Rocky Road.